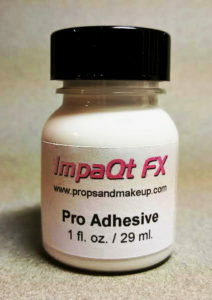 Pro adhesive and spirit gum are used as adhesives for foam latex masks and appliances. 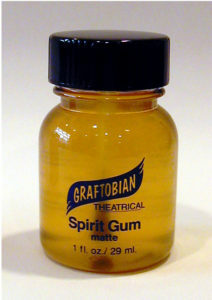 While spirit gum has been around for years, Pro Adhesive will last longer and is extremely strong. Liquid latex is also an adhesive but is not nearly as strong. It is much better at building up the skin, creating scars, bullet hits or making latex repairs. TIP: If you plan on reusing your mask or appliance, we recommend that you use only 99% rubbing alcohol. Pro Adhesive Remover is great for removal and cleanup. However, it contains an oil that will bloat the edges of the latex mask or appliance. It will be impossible to blend the mask or appliance into your skin the next time you use it. Check out our Makeup Application Kit. It has everything you’ll need to apply your foam latex mask our appliance.